Cal metal fans, don't miss this! 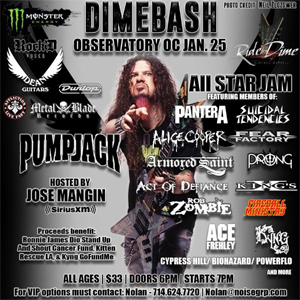 Santa Ana's Observatory OC (3503 S Harbor Blvd) will host a massive DIMEBASH, fueled by Monster Energy, on Thursday, January 25! The event will be hosted by Sirius XM's Jose Mangin and sponsored by Rock'D Vodka, Dean Guitars, Affliction Clothing, Dunlop and Metal Blade Records. The event is all ages and costs only $33 at the door. Doors open at 6:00 PM and the event starts at 7:00 PM. Tickets are available via www.observatoryoc.com. DIMEBASH will feature an unprecedented all-star jam featuring members of bands such as PANTERA, SUICIDAL TENDENCIES, ROB ZOMBIE, ALICE COOPER, FEAR FACTORY, ARMORED SAINT, KING'S X, ACE FREHLEY, KYNG, CYPRESS HILL, BIOHAZARD, POWERFLO, FIREBALL MINISTRY, PRONG, ACT OF DEFIANCE, and more to come! An official afterparty, presented by Affliction, will take place at Affliction Soundstage (1799 Apollo Ct., Seal Beach, CA) with doors opening at 10:30 PM and starting at 11:00 PM. The taco metal afterparty will be 21+ and will feature WHISKEYDICK, KYNG and all female PANTERA cover band COWGIRLS FROM HELL. The afterparty is sponsored by Modelo, Riazul, QSC, Roland, Sirius XM Liquid Metal, Rock'd Vodka and Monster Energy, and will also be hosted by Jose Mangin. For both events, all proceeds will benefit the Ronnie James Dio Stand Up And Shout Cancer Fund, Kitten Rescue LA, and KYNG's GoFundMe Campaign set up to help them recover stolen gear and transportation. Dug Pinnick of KING'S X says,"I love being a part of DIMEBASH. So many friends and musicians show up and it's like a family reunion. And keeping Dime's party tradition in full bloom," and PANTERA's Rex Brown adds, "DIMEBASH, to me, is the epitome of celebrating his life and music all in one night! He was always about camaraderie, brotherhood and a killer f*ckin time! DIMEBASH Smokes On." KYNG's Eddie Veliz says, "DIMEBASH is one of the best shows/parties KYNG has played. One of the greatest memories of my career happened at DIMEBASH 2016 when I had the pleasure of playing PINK FLOYD's "Wish You Were Here", the details to this story are very long winded but let's just say it involved a couple of acoustics guitars and Dave Grohl. We are proud once again to play DIMEBASH 2018 because the proceeds always go to a good cause and a life is celebrated. Dimebag helped me mold the sound of KYNG through his music and I will always have a massive place in my heart for him, Rita Haney and the entire PANTERA family." Right now, fans can order Dimevision Vol 2: Roll With It Or Get Rolled Over, the follow up to the poignant first Dimebag Darrell video memorial set, Dimevision Vol 1: That's The Fun I Have, via Metal Blade Records. In its first week, Dimevision Vol 2 debuted at #3 on the Top DVD Music Video chart.